Glory To God Television is making plans to expand our broadcast coverage further into the Metro-Atlanta area this year. By developing smaller broadcast areas in stages, we are able to stay connected with our viewing audience through special programming and events. 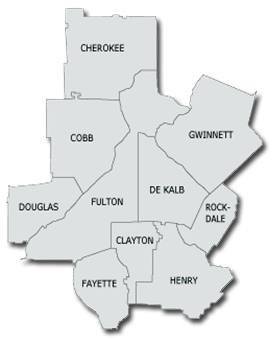 Clayton County includes the cities of Forest Park, Jonesboro, Lake City, Lovejoy, Morrow and Riverdale. Cobb County includes the cities of Acworth, Austell, Kennesaw, Marietta, Powder Springs and Smyrna. DeKalb County includes the cities of Avondale Estates, Chamblee, Clarkston, Decatur, Doraville, Lithonia, Pine Lake and Stone Mountain. Douglas County Includes the city of Douglasville. Fayette County includes the cities of Brooks, Fayetteville, Peachtree City, Tyrone and Woolsey. Fulton County 0ncludes the cities of Alpharetta, Atlanta, College Park, East Point, Fairburn, Hapeville, Mountain Park, Palmetto, Roswell and Union City. Gwinnett County includes the cities of Berkeley Lake, Buford, Dacula, Duluth, Grayson, Lawrenceville, Lilburn, Loganville, Norcross, Snellville, Sugar Hill and Suwanee. Henry County includes the cities of Hampton, Locust Grove, McDonough and Stockbridge.